We went to Burlington for the day, with Garth and Danielle. This was neat, a garden right in the middle of the city! I actually like this picture a lot. Joe and Julia, being silly. Uncle Bill, cooking out over the fire. 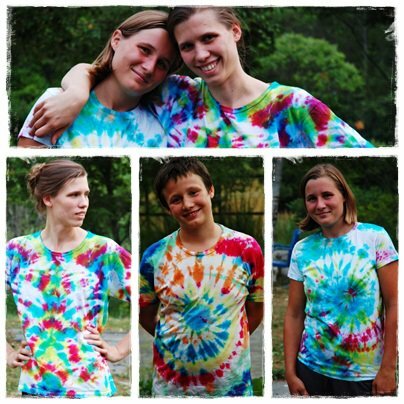 Aunt Joslyn introduced us all to tie dying! and Garth, making an incredibly unique face...rather scary, in fact. Danielle decided to dye some washcloths. and later, after we returned home, the finished shirts! Looks like you guys had a fun trip!! And it's always doubly good to be home! Those pictures make me want to return to New England to visit my family! Speaking of family (and tie dye), my daughter recently put a picture on Facebook of two year old Anna, who happened to be wearing a tie dye shirt. Thankyou for sharing thoes pictures! It looks like you had alot of fun on your trip! How nice to be able to get out of town for a bit, commune with nature, and do fun things! Im from northwest,and midwest,and now live in texas. Ive never seen that other sides of the country. Looks beautiful. Wonderful time of fellowship...just lovely...I think I might could live there...blessings young friend.By the way...I love your shirts...they turned out wonderful. Your camping trip looks just delightful! What a pretty little cabin. We're planning a tent camping trip later this summer...I can hardly wait! Your shirts look awesome! I've always wanted to try tie dieing. I am in love with the red fridge. It looks like great fun and what a cosy looking camp! I've always wanted to go camping, but with the weather in the UK it's probably best I don't! Vermont looks lovely. beautiful!!!! Could I please save a few photos of your sewing projects in a folder on my computer for inspiration on home made feminine clothes? My Mother and Sister and I are learning to sew our own skirts and we want to sew blouses and dresses too!!! Blessings!!! God Bless you!!!! The camping looks like so much fun. Soon for me!